Every year, millions of tons of solid waste is generated in households around the world and which is disposed of in council and municipal landfill sites, while at the same time, millions of units of energy from coal, oil and natural gas are burned daily to create the electrical power we need to run our homes and workplaces. Today, a new generation of Waste to Energy, (WTE) conversion technologies are emerging which hold the potential to create clean renewable energy from solid and liquid waste materials. The energy content available from combustion of solid waste represents a significant “alternative energy” supply to help reduce the use and our dependency on conventional fossil fuels. “Waste” by definition includes any waste materials other than liquids, gases and any non-usable by-product generated as a result of a process or production that is no longer deemed valuable, and are therefore normally discarded. Such waste materials typically originate from either the residential community as municipal solid waste or from commercial, light-industrial, and agricultural wastes. Wastes generated from heavy industrial manufacturing activities, chemical and medical industries are typically classified as hazardous wastes and are generally not used to convert this type of waste to energy. Traditionally the term “waste to energy” has generally referred to the practice of incineration of waste products either by burning the rubbish in the back yard or by large industrial incinerators to produce heat. The category of waste to energy broadly describes any of a number of processes or technologies in which a useful byproduct (energy) is recovered from an otherwise unusable source. Waste to energy technologies physically convert waste matter into more useful forms of fuel that can be used to supply energy. These waste to energy processes includes thermal conversions such as combustion (incineration), pyrolysis, gasification, or biological treatments such as anaerobic digestion and fermentation, etc, and various combinations of the above. For example, solid wastes can be converted into fuel pellets and along with gasified waste co-fired with fossil fuel coal in an existing conventional coal fired power station. Energy can be derived from waste in a number of ways. Waste to energy processes include wastes that has been treated and made into a solid fuel for incineration to produce heat and steam. Waste that has been converted into biogas or syngas from both organic and inorganic wastes, or biological technologies, in which bacterial fermentation is used to digest organic wastes to yield fuel, converting the waste to fuel. Below are some of the more common ways in which waste is converted in energy. • Combustion – This is by far the oldest, most common and well-proven thermal process using a wide variety of waste fuels. Municipal and household waste is directly combusted in large waste to energy incinerators as a fuel with minimal processing known as mass burning. The earliest waste combustion systems were simple incinerators which produced heat and carbon dioxide, along with a variety of other pollutants and had no energy recover capabilities. Today the heat energy generated from the combustion process is used to turn water into steam, which is then used to power steam-turbine generators to produce electricity. Most modern waste incinerators now incorporate heat recovery systems and air-pollution control systems. The mass burn process burns the waste virtually as it is received thereby eliminating the need to process the material prior to burning except for the removal of oversized items and obvious non-combustible metallic materials. The problem with this mass burn approach is that after combustion, the incinerators ash and other pollutants removal system must be capable of disposing of every bit of the size and capacity of the combusted material coming out the incinerator as it is going in. • Gasification – Note that gasification of waste materials is not the same as incineration. Incineration is the burning of waste fuels in an oxygen rich environment, where as gasification is the conversion of waste materials that takes place in the presence of limited amounts of oxygen. Gasification is a thermochemical process that converts solid wastes into a mixture of combustible gases. Steam or the oxygen in the air is reacted at high temperature with the available carbon in the waste material to produce gases such as carbon monoxide, hydrogen and methane. The gasification process produces a syngas (hydrogen and carbon monoxide) which is used for generating electricity power. Whereas the incineration of waste to energy converts the fuel waste into energy directly on-site, thermal gasification of the waste materials allow the production of a gaseous fuel that can be easily collected and transported. • Pyrolysis – This is also a thermal process similar to gasification above which involves the thermal degradation of organic waste in the absence of free oxygen to produce combustible gases. In other words, pyrolysis uses heat to break down organic materials in the absence of oxygen. Materials suitable for pyrolysis processing include coal, animal and human waste, food scraps, paper, cardboard, plastics and rubber. The pyrolytic process produces oil which can be used as a synthetic bio-diesel fuel or refined to produce other useful products. Although pyrolysis technology has been around for a long time, its application to biomass and waste materials is a relatively recent development as pyrolytic products are more refined and therefore can be used with greater efficiency. A common byproduct of pyrolysis is a kind of fine-grained bio-charcoal called “biochar”, which retains most of the carbon and nutrients contained in biomass so can be used as a soil enhancement to increase soil productivity. • Anaerobic Digestion – Landfilling is still the primary method of disposal of municipal solid waste and if left undisturbed, landfill waste produces significant amounts of gaseous byproducts, consisting mainly of carbon dioxide (CO2) and methane (natural gas, CH4). 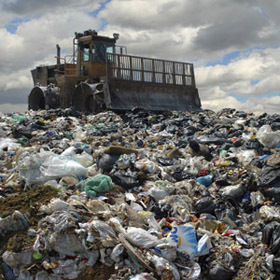 This landfill gas or “biogas” is produced by the anaerobic (oxygen-free) digestion of organic matter. Anaerobic digestion to produce biogas can either occur naturally producing a landfill gas, or inside a controlled environment like a biogas digester. A digester is a warmed, sealed, airless container where bacteria ferment an organic material such as liquid and semi-liquid slurries, animal wastes and manures in oxygen-free conditions to produce biogas. The main advantage of anaerobic digestion for converting waste to energy fuel is that it deals with “wet waste” which normally may be difficult to dispose of. The amount of biogas produced is limited by the size of the digester tank, so is largely used as a fuel for small-scale operations, such as farms, where enough energy can be produced to run the farm. The biogas produced can be burned in a conventional gas boiler to produce heat or as fuel in a gas engine to generate electricity or fuel some of the farm vehicles. • Fermentation – Fermentation uses various microorganisms and yeasts to produce liquid ethanol, a type of alcohol, from biomass and biowaste materials. The conversion of waste to energy by fermentation requires a series of chemical reactions to produce the ethanol biofuel. The first reaction is called hydrolysis, which converts organic materials into sugars. The sugars are then fermented to make dilute ethanol, which is then further distilled to produce a biofuel grade ethanol, (ethyl alcohol). With increasing global consumerism and population growth leading to an increase in the levels of waste materials we produce, waste management technologies are now helping to find alternatives to landfills by converting as much of the mixed general waste back to be recycled or reused as possible in an attempt to turn waste into energy and waste into fuels. Rather than sending residual wastes direct to landfill, advanced conversion technologies coupled with advanced pollution control systems can be employed to convert these calorific materials into clean energy. Advanced waste-to-energy technologies can be used to produce biogas (methane and carbon dioxide), syngas (hydrogen and carbon monoxide), liquid biofuels (ethanol and biodiesel), or pure hydrogen. Just as oil, coal and gas are used as fuels in a fossil fuel fired power stations, these alternative biofuels can also be converted into electricity. Converting Waste to Energy has many advantages too by not only reducing the amount of landfill dumping, but by reducing the amount of greenhouse-gas emissions and pollution we pump into the atmosphere each and every year as well as reducing our dependence on non-renewable fossil fuels. However, many waste to energy conversion technologies are designed to handle only one or a few types of waste and can be difficult to fully separate different types of waste materials. Advances in non-incineration conversion technologies and methods like pyrolysis and thermal gasification are providing ways of generating clean energy from waste materials that avoid many of the pollution concerns around conventional incineration and combustion. Today, we have the technologies and options available to us to separate the bio-waste which should be recycled, from the waste that can be used as a valuable and future energy source turning waste and other renewable waste fuels into clean energy. pls provide full details of how to convert garbage waste in energy, oil and other uses. pls support me bcoz I want do something especial for my country and needle people.